How In The Geek Did I Happen? It was only a matter of time before my Inner Geek made its auspicious way into the world. There’s no time like the present and, since I am a senior, I savor the present like a fine wine. Previous to this, I was a full time musician. (thanks Mom for the musical genes). I sing, I conduct, I teach and those passions still remain with me even though I have moved forward to this new phase in my life – Geekdom. Yes, I love gadgets of all sizes and shapes (thanks Dad for passing along these genes), especially Apple products. I also adore the short-lived Flip Camera and many of the Elgato Products, the latter having been approved by the Apple Kingdom – so one can’t go wrong, can one? My grandchildren have ignited my enthusiasm. Instead of teaching them how to cook and bake, I introduced them to the World Wide Web. They have flipped and pinched their way to happiness via my IPhone 4 and IPad 2. When they visit, which seems to increase with frequency as I acquire the latest and the greatest in technology, recording sessions and movie-making projects are “must-do” activities in our home. It is because of their enthusiasm and sense of wonder that I have dedicated this site to my grandchildren. They are my life force and my reason to grow and develop beyond my senior years. So, Kyra, Ryan, Alexandre and Amelia – this is for you. I hope you enjoy the ride along with me. And special thanks to my dear husband and my beautiful daughters and their hubbies for their unending love and support. 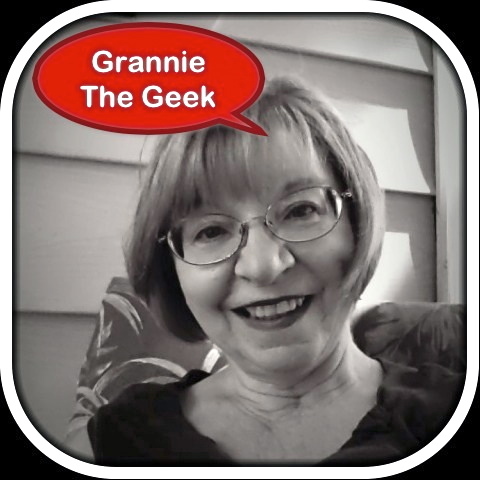 Wow..I am blown away at the professionalism of this blog GrannyGeek.. I am also very excited to know that there are others in our gene pool that finds technology so invigorating. My influence in technology was the Master of Modules, our very own Zio Albert, who could swap a circuit board out of a 1957 Hotpoint B&W Television set faster than an auctioneer could call out his bids. Keep it up GG. I look forward to following you on this wonderful site!!! Thank you so much Paul. And, yes, Zio was a wizard wasn’t he? However your Mom and my Dad loved gadgets. My Dad was constantly purchasing the most current gadget out there – I inherited all this from him. And so did you from your Mom!! I have to continue to add more topics on a regular basis and you just may have ignited my drive and devotion – propelled it to another level. Thank you so much for stopping by. Send the rest of the seniors over here. We can learn together. !!!! Getting old is for sissies!! !